There are 40 or so people here that can understand why Foy is absolutely thrilled with this little bazooka. In a model of how group buys should be conducted, our own E1320 thought he would offer to do a driver swap/upgrade on the popular UltraFire UF-2100. Expecting a handful of guys to respond to this kind gesture, E was immediately bombarded with overwhelming demand. 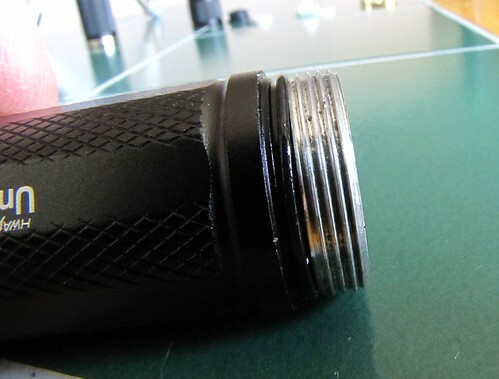 When the dust settled, Erik had a very tired soldering gun and about 41 of us lucky forum members got the most powerful flashlight this form factor has ever seen. This custom 5-mode UF-2100 is not just Foyapproved, it's . 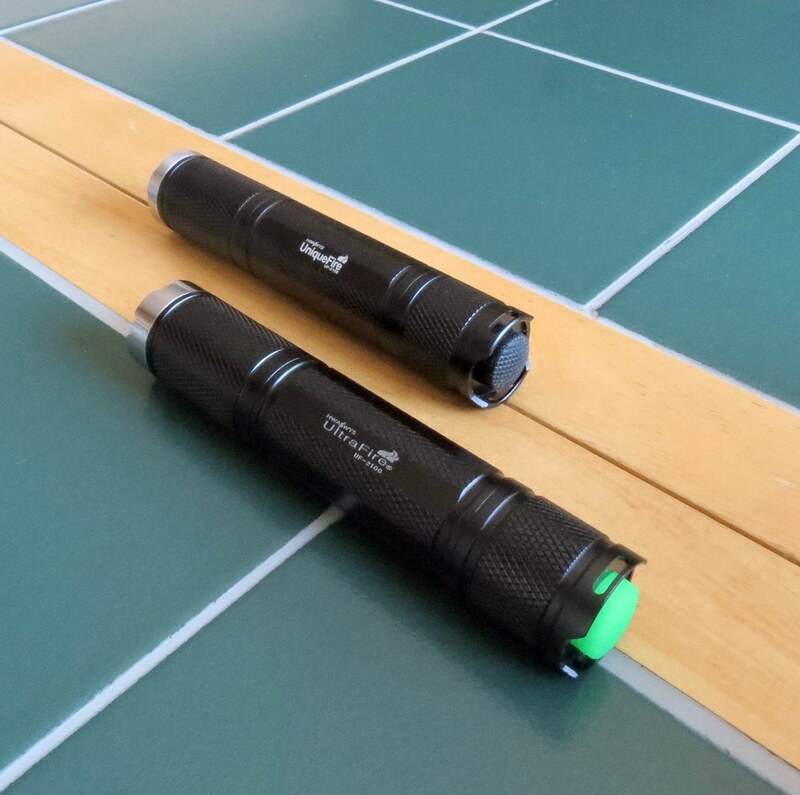 . .
Bottom line: Possibly the brightest 18mm-reflector torch available (over 800 lumens) the UltraFire UF-2100 as imagined by E, is a true flashaholic's flashlight with explosive performance. The driver swap does away with stupid disco modes in favor of an inspired, custom 5-mode UI with a .01-.02 moonlight and a thundering 3.5 amp turbo. 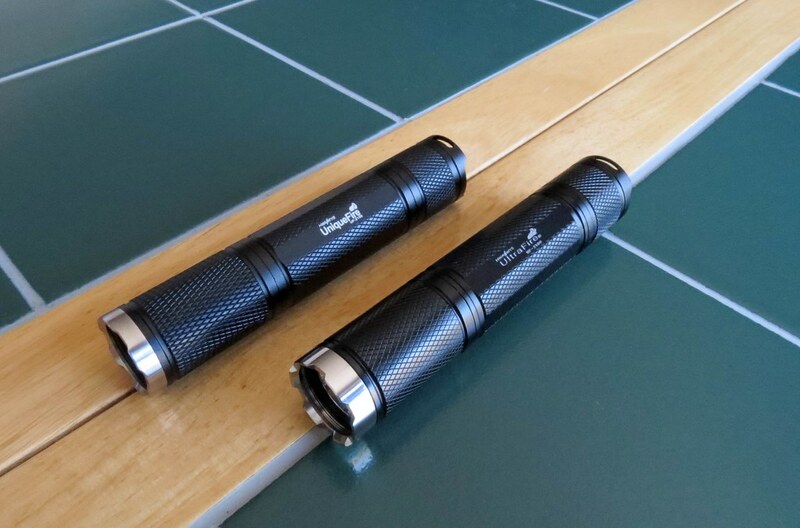 Beautifully spaced, the Nanjg 105C transforms the UF-2100 from a nice flashlight value into a serious, high performance pocket-rocket. The price? An amazing $27 CONUS. No BS, no excuses, everybody was Johnny-on-the-spot with the Paypal and Erik put a one-of-a-kind flashlight in everyboy's hand in record time. Pay attention folks, this is how it's done on BLF. 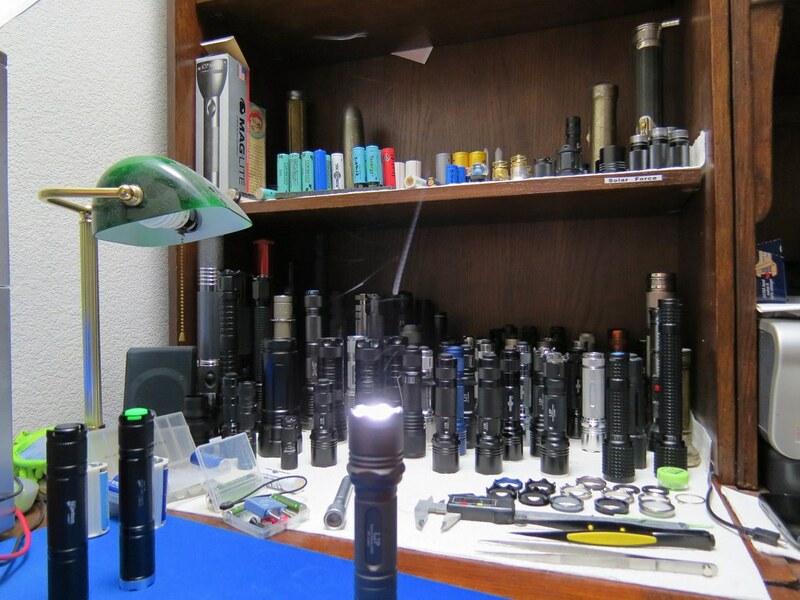 What a shpment of 40-odd flashlights looks like. 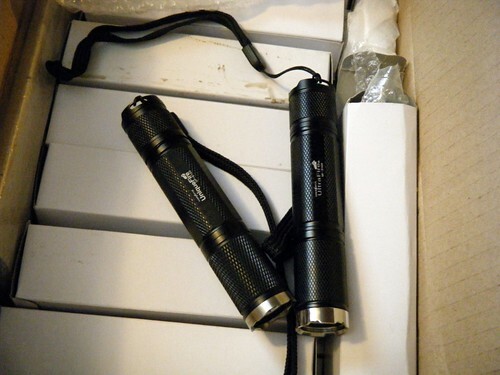 I ordered two flashlights and E sent one of each "brand," an UltraFire and a UniqueFire. The UniqueFire is the fake, assuming the UltraFire is not. There are exterior differences, although the finish on both isn't particularly impressive. The anodization looks and feels too much like paint and the knurling on both is not significant, maybe slightly less so on the UltraFire. 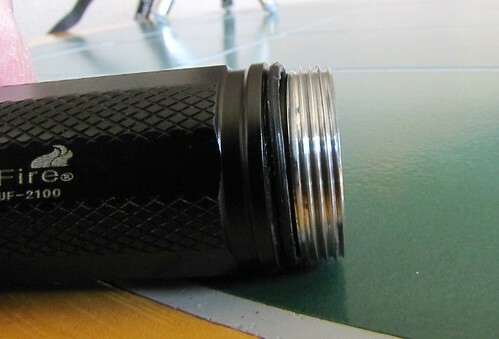 The UF-2100 was originally designed as a tail-stander, with two side-cut holes to allow tail standing with lanyard use. As built, the boot on both lights protrudes too far to tail stand, the GITD boot on the UltraFire sticks out a tad more than the UniqueFire. 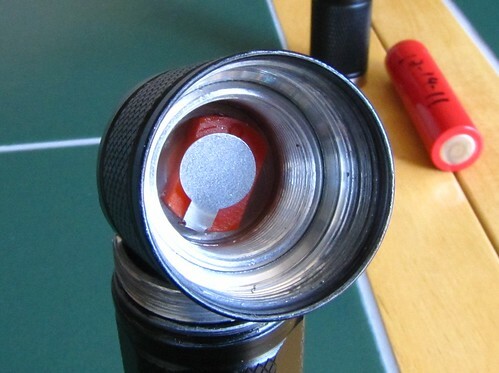 I sometimes like a nifty graphic but generally, most flashlights look better with nothing printed on them at all. I think that is especially true with these little gems. From the department of nobody cares what Foy thinks: I don't like the word "Cree" on any torch. The UF-2100's best asset is probably its size. It's hardly bigger around than a MiniMag and is shorter. I like the comparison because these custom UF-2100's are to a MiniMag what a Chevy Rat is to a three cylinder Metro. I'm serious; the unknowing will comment when you power up this bad boy in a dark place. It won't be dark any more. The most noticeable difference is probably the crenulated bezel. It's a little deeper and shinier on the UltraFire but the bezel threads are visible. Foy prefers less aggressive and smoother bezel on the UniqueFire. 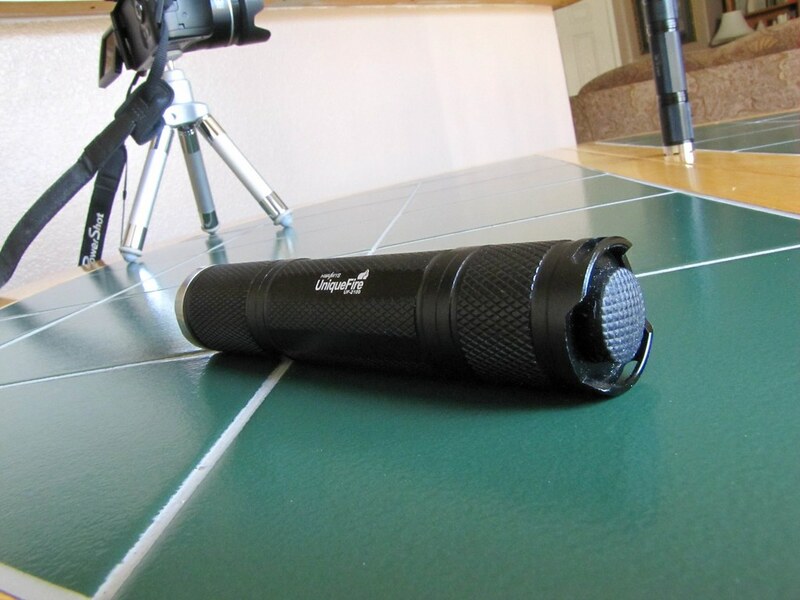 The knurling on the UltraFire looks a lot smoother, and it is. The difference is less significant to the touch, however. The UltraFire looks rather handsome in this shot with our two trouble-maker cats, Marx (left) and Ted (right.) Despite their complacent mood here, their capacity for bedlam is instant and enormous. 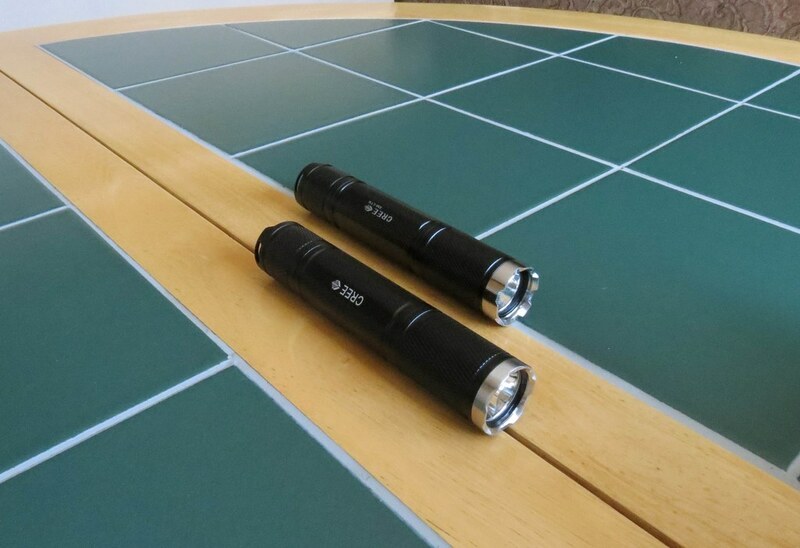 The UltraFire at left has an AW/IMR battery. 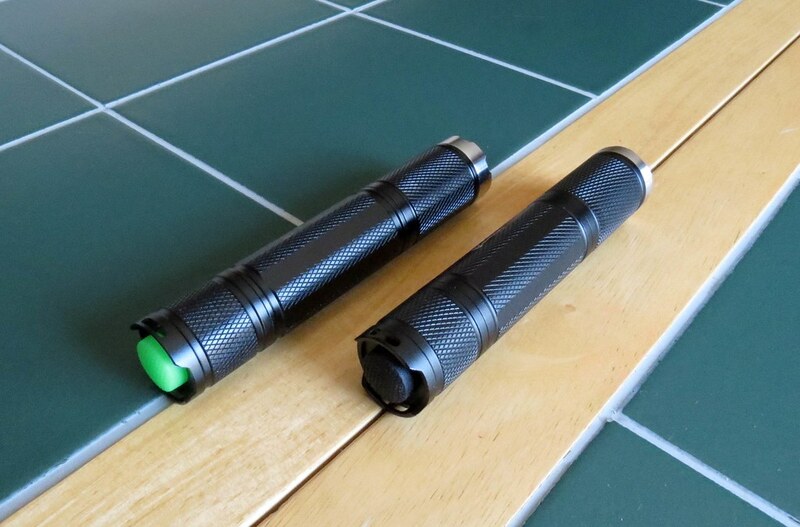 The UniqueFire (right) has a protected Xtar 18700 that works in this light courtesy a springless tail cap switch . . . 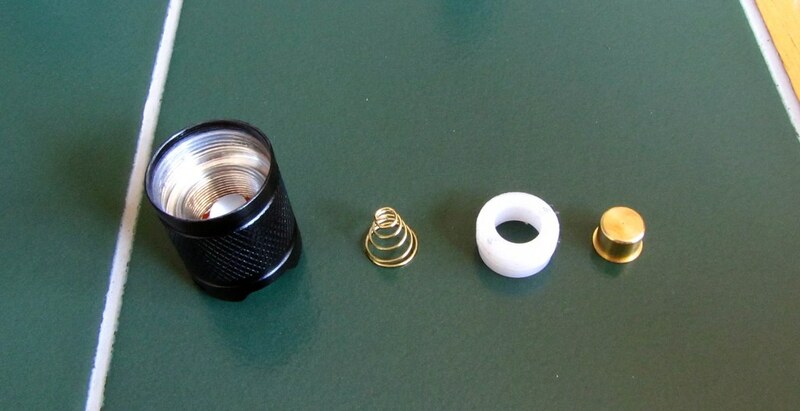 The UltraFire switch is more conventional and has a plastic locking ring. Which brings us to this light's raison d'etre and I'm going to use the well known UltraFire XM-L from Manafont (sku 5720) as a benchmark. 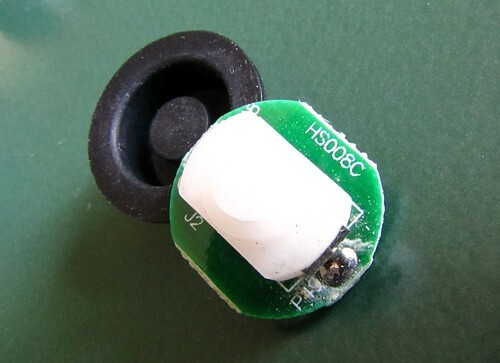 Keep in mind, this drop-in has a significantly larger reflector and pulls upwards of four amps on high. All beam shots were taken with a 1/4 second shutter speed @ f2.7. 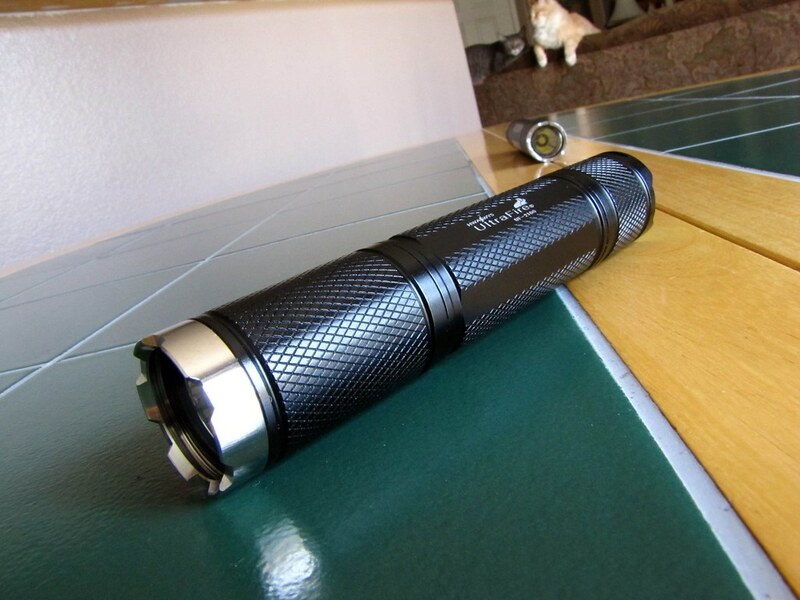 This is my grey Solarforce L2P with the UF XM-L drop-in. UniqueFire with protected Xtar 18700. It has a significant green tint on the outside edge of the beam but the center spot and corona are not nearly as green. Nevertheless, I love the beam profile with this SMO but hate the tint. UltraFire with AW/IMR. I normally prefer an SMO but the OP on my UltraFire makes a wall of light like I've never seen. My bad aim makes these beam shots somewhat misleading so I also include some ceiling bounce shots. 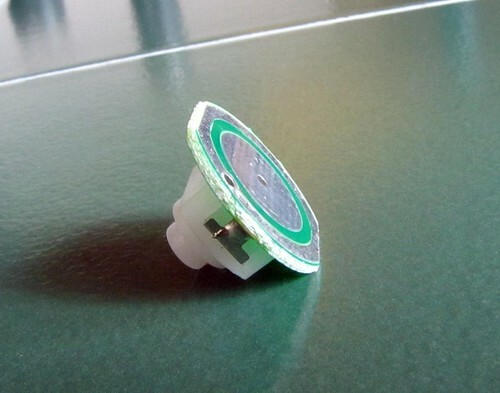 As you can see, the UF-2100 is easily the equal of one of the brightest P60 drop-ins available. Its terrific small size is also a liability when driven as hard as this light is. There is no mass and even with the 2.8 amp version, turbo should only be used for relatively short periods. My 3.5 amp UltraFire does indeed feel like fire in turbo mode, very quickly. The head reached 130º in less than three minutes. 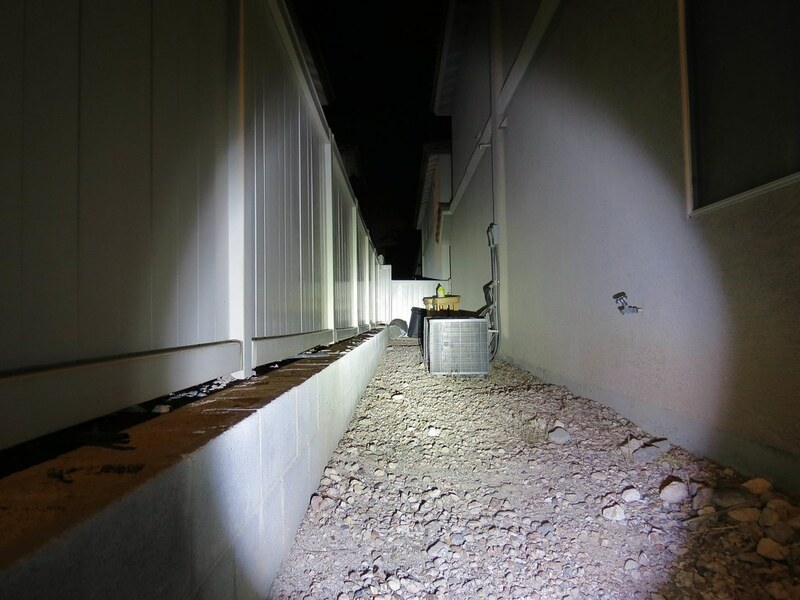 The beauty of this arrangement of course is that 500 lumens on high can be used almost without worry. I did my run time test with the UltraFire on high and when I occasionally held the head in my fist to wick away heat, it ran 1:45 non-stop, barely reaching 100º. Nice to have a "military" burst available when you need it. 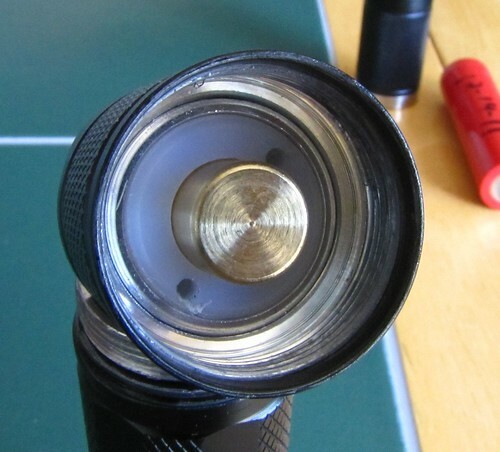 This is an incredible flashlight, to say the least. 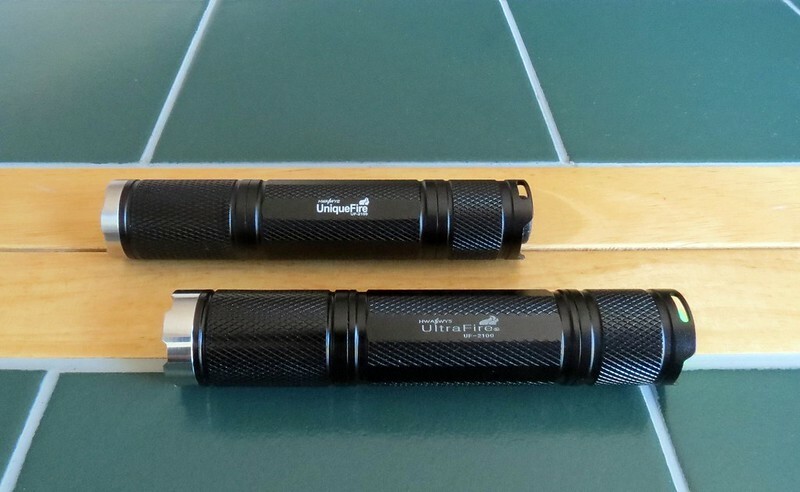 The UltraFire UF-2100 as defined by Erik, puts big power in a small package. 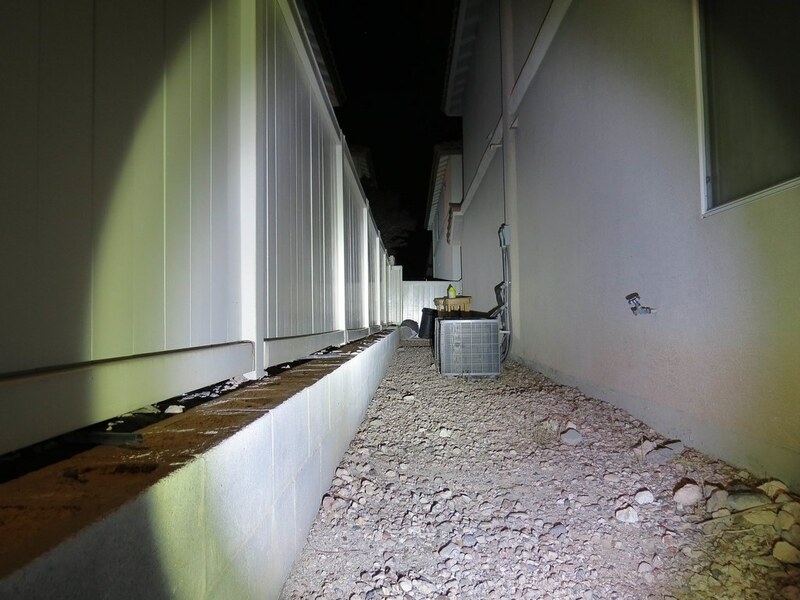 The versatility of a torch capable of a discrete one lumen and 850 lumens is as rare as it is impressive. Equally amazing is the way this whole group buy went down. 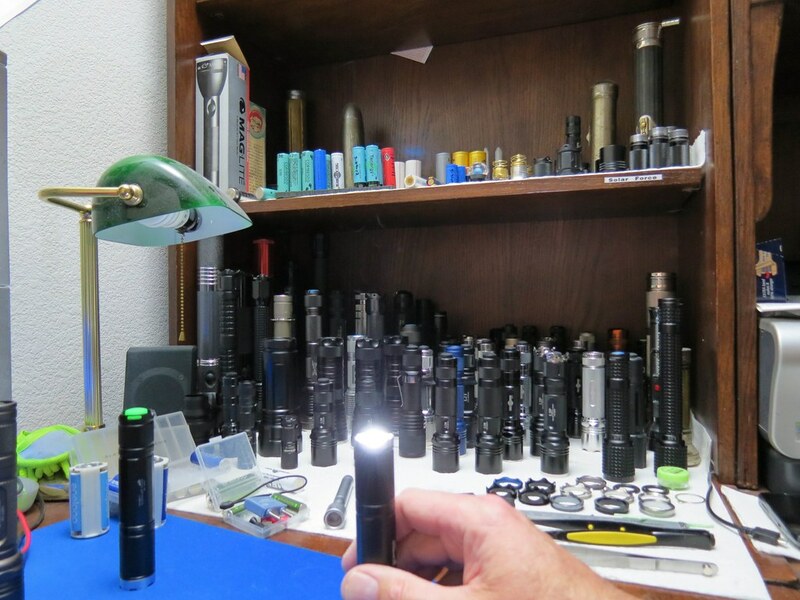 It was a fun experience for all that ended with a sensational flashlight for everybody. Only on BLF, my friends. Never forget that. I will also add and correct information from E as I read through the GB thread and PM's. Awesome review as usual and thanks for all the kind words. I hope everyone else enjoys there lights as much as you do. 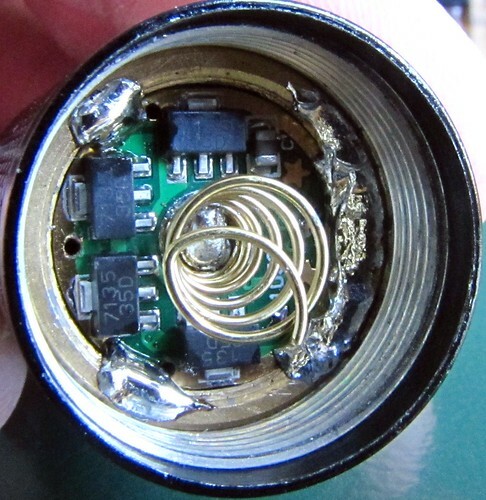 I will say those are some ugly solder joints the attention to detail in the soldering department wasn’t there like my typical drop in builds, but I have never done an assembly line type construction before so as long as they held together and worked they got shipped. I also have to comment on the patients and willingness to prepay by all the participants in this group buy. It was very impressive and made the whole deal go down without a hitch. Thank you everyone for you patients and trust in me to prepay for your light. 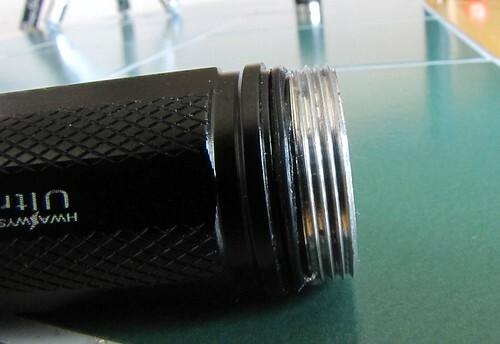 Great review of a great light! I love mine. Great review, as usual. Thanks for sharing Foy! 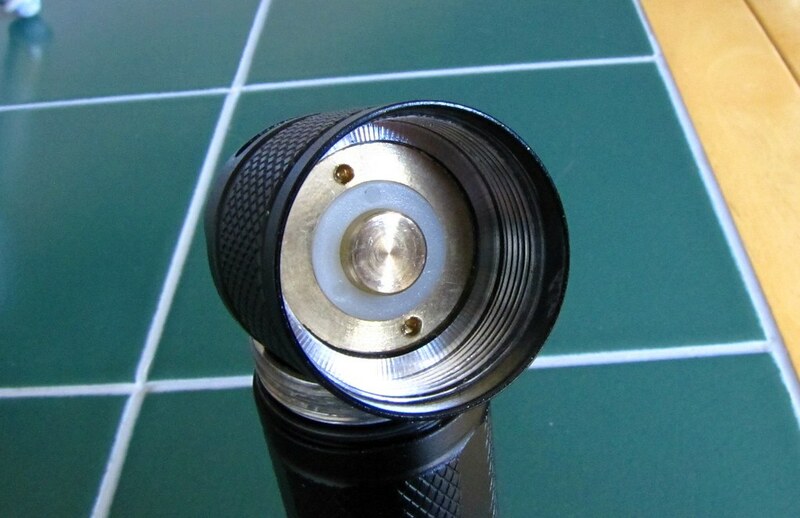 And a great flashlight, especially the modes. Now I regret not ordering one.. Maybe next time then.. Awesome review. I read the story about these lights from the start and cannot believe the generosity and at times patience shown from E on this build, not only building the lights but knowing that there would be one or two issues after the build. Thanks again Foy for the review and E for effort for E1320. Both of mine tailstand just fine… I think the force of all those photons coming out would let it tailstand on the ceiling. Or if you let it go or drop it, it will fly around like a toy balloon out of hell. im glad i didnt opt for the 3.5a one. my 2.8a gets too hot to comfortably hold after 2 minutes. would it be worth trying to pot the driver to add some mass? 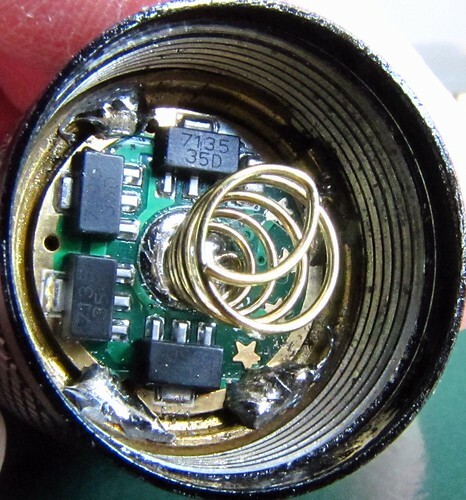 the soldering holding the driver together came off on one of mine anyway and i noticed it was really empty inside so i figure adding a few grams wouldnt hurt right? 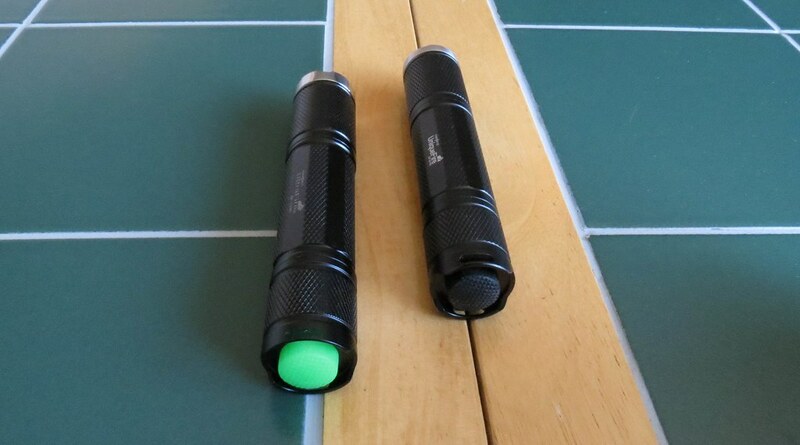 i too noticed the green ring on my uniquefire also but its negligible when youre outside using it. anyway thanks again erik. 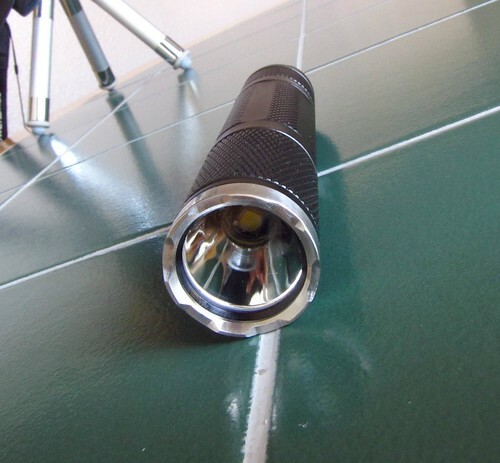 great groupbuy deal on a great light. I noticed on the first batch I made after I sent them out that I didn’t add enough Flux and some of the solder joints came loose because of the extreme heat after extended use on turbo mode. If you want to send it back I will fix it for free and pot it if you want. 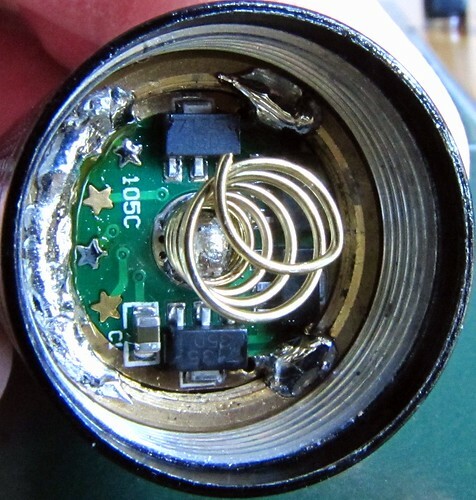 There really is no way a light this small is going to handle that many amps regardless of how much Fujik I pack into the pill. That’s why it has a reasonable 1.4 amp high, the turbo mode is just for short bursts only. Like I said, that's the beauty of this UI. 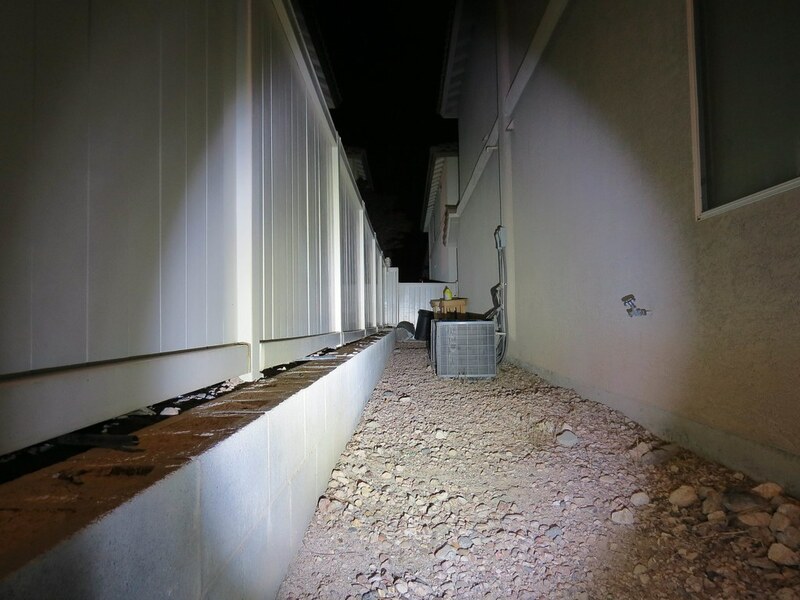 The light puts out something around 500 lumens on high. I ran mine last night on high for 1:45 non-stop, with no heat issues at all. That extra couple of hundred lumens on turbo is there when you need it and it will run for 2 or 3 minutes with no problem at all. Great review, great light. Thanks to both of you! The drivers are ordered a few days ago and now I have to wait. So glad I picked up on this DEAL. One of the neatest lamps I’ve acquired. 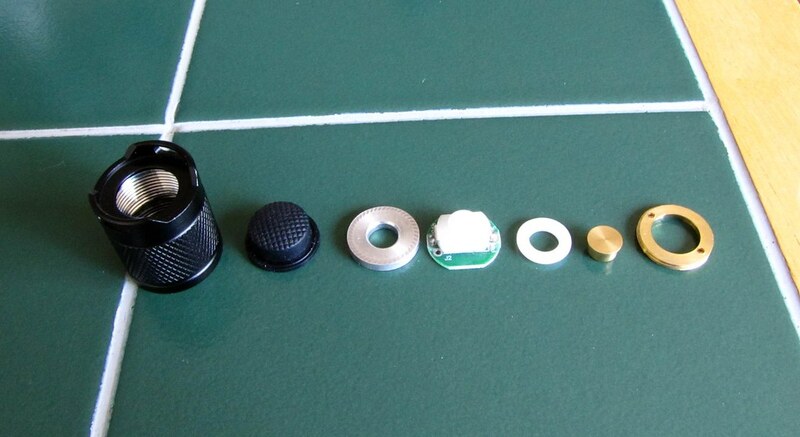 ANOTHER Fantastic Review Foy, Very Nice Photos and Technical information. Eric, there has been increased interest since your mod, Will there be a SECOND Round for this UF-2100 with modifications? 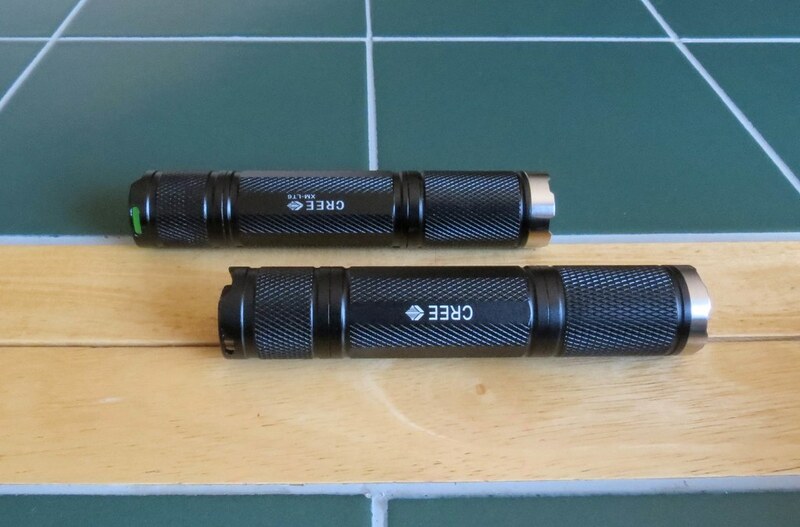 I have the normal un-E1320 modified uniquefire. It draws 2.8a and gets too hot after 5 minutes or so on high. This looks like the perfect solution for this light. Great review Foy and nice work E1320. Sweet light! Thanks so much for the review, Foy, and a huge thanks to E1320 for having made this. What an incredible exclusive perk for BLF members. Awesome group buy and awesome light. 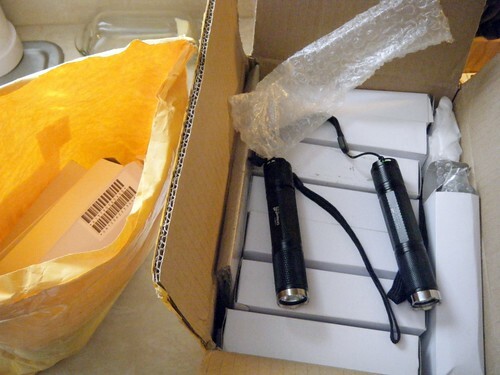 Thanks to Foy for the review and to Erik for putting together a quality light. Come on, I read around 3A with IMR cell with stock 3-mode from DD deal for 9,85 USD. It has nice heavy pill, but still too small to run on hi for more like minute or so. Booo. I knew I was going to regret not getting in on this deal. Great review Foy. Everyone who got in on this deal should consider themselves lucky(smart). Is this an “off the shelf” 105c, or is the driver itself customised? 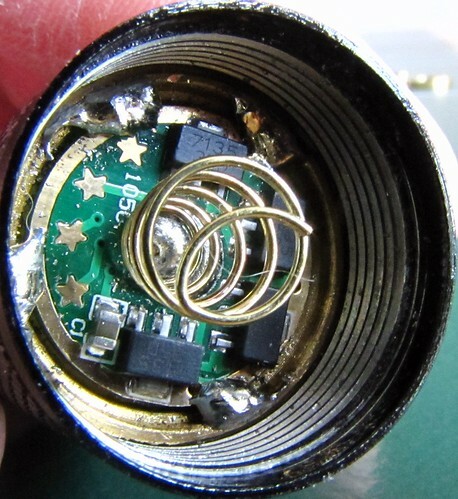 It is a 105C driver that has been reprogrammed by Erik with 5 brightness modes from moon up thru 2.8 Amp or up to 3.5 amp with extra current regulators installed. No strobe or SOS. 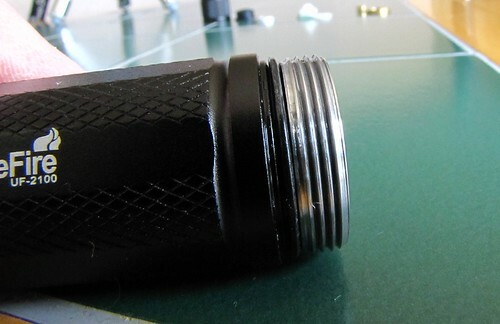 I have the same opinion of the OP reflectored Ultrafire its a absolute wall of light and basically its all a hot spot! 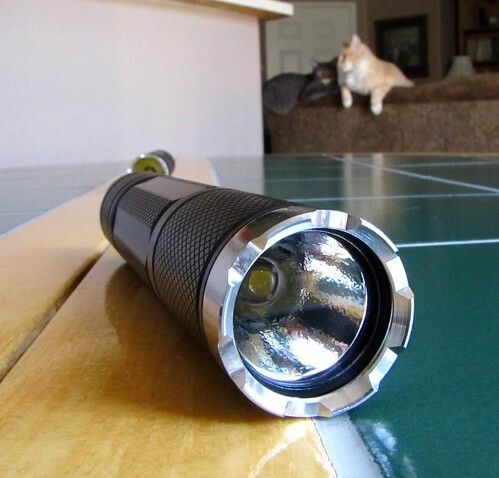 I definately dont own anything similar to this light. I am so very pleased with this light and its my walk around the yard light. Thanks for the review and putting the words in my head on paper. Thanks for the work that you did E and for the care package. 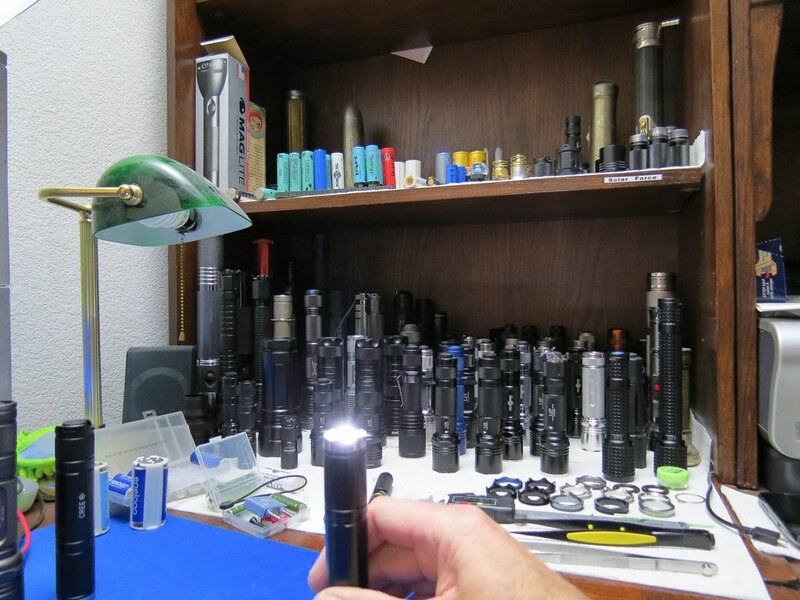 I would love to have a llight this size with the same beam pattern in a AA/14500 package. 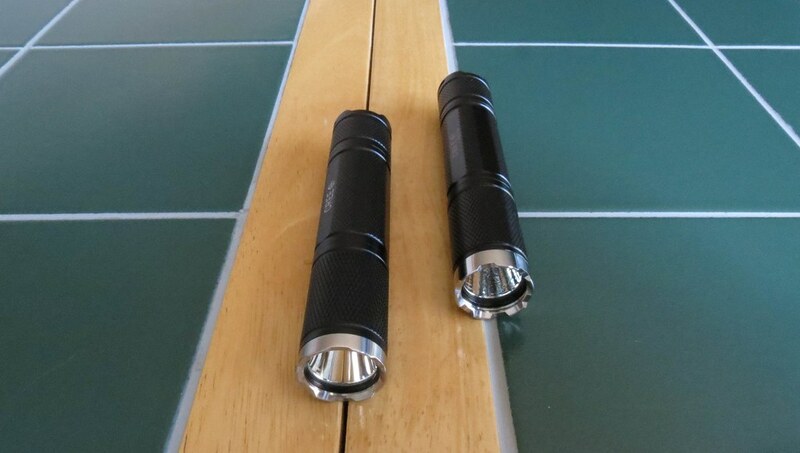 And of course, thanks to Erik for these BLF exclusive custom torches! Erik can make you one . The one he made for me is the reason I didn't get in on this group buy . And believe me , a 14500 size light pushing 3.5A into a 3C tint XML is totally awesome . Yes I am going to do another group buy deal with the AA/14500 host once I get caught up with all my backed up drop in orders. I will start a new thread next week. 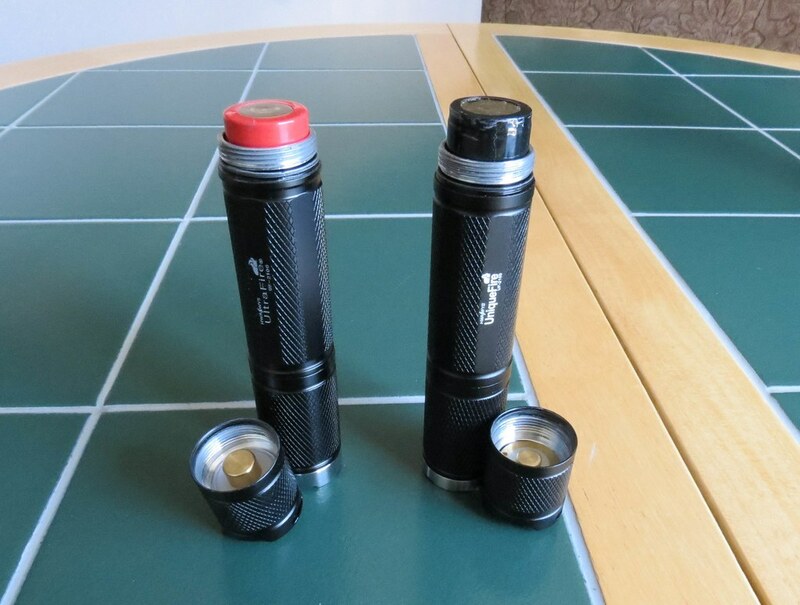 Since I missed out on the 18650 version, I will definately pick up the 14500 light. Could we get them in neutral? that would be a dream light. thanks e1320 for what seem like awesome lights. Yes, I sould have included that the 105C was programmed. Will add that. Great job on the review and photos Foy and great job to E1320 as well!!! I would like to see a custom job on the Ultrafire U20S that KD has too but it’s kind of high priced to justify a mod. The description is incorrect as usual but I love the host! Thanks Erik! I’m curious to see the 14500 monster. I have been in deep regret that I did not grab this one. Will not pass the next 14500 one. Great review Foy and great light E. Thank you.